Hi Diane! 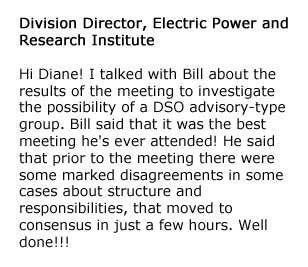 I talked with Bill about the results of the meeting to investigate the possibility of a DSO advisory-type group. Bill said that it was the best meeting he’s ever attended! He said that prior to the meeting there were some marked disagreements in some cases about structure and responsibilities, that moved to consensus in just a few hours. Well done!! !